A 12-page Motion for Reconsideration (MR) was submitted by Dataland, Inc., the project proponent of the assailed proposed 12-story beachfront hotel to the Office of the Building Official (OBO) of the Local Government Unit (LGU) of Panglao to “reverse and set aside” its notice of recall and amendment of the building permit issued on February 15, 2018. Panglao Municipal Engineer Rogelio S. Bunao signed the notice two days after a site inspection was conducted by a joint on-site inspection team that found the “exact location” of the 12-story structure violated the specific provisions of the LGU’s Comprehensive Land Use Plan (CLUP) and the physical development guidelines of the Municipal Zoning Ordinance. Bunao earlier approved the construction of a 12-story building as proposed by Dataland on June 19, 2017, even as he threatened to cancel the building permit after reports reached the OBO of diggings, seepage of wastewater into the sea from the construction site and perceived violations of the National Building Code (NBC). Bunao, in his order to amend the height of the applied 12-story building, stressed that according to the municipal zoning ordinance height of buildings within the beach zone is limited to 3-stories or 18 meters from the original ground line for the first 50 meters from the easement and may increase to 5-stories only. The municipal engineer, who has yet to act on the MR of Dataland ordered the downscaling of the proposed 12-story building to “only 5-6 stories”. The proposed structure is now on the 5th floor of construction. Work has been halted after Project-in-Charge, Engr. Ritchie Arabis was ordered to stop. The notice of recall and order to amend was addressed to White Port, Inc., contractor of the planned upscale beach hotel located in a 1,647 sq.m. lot in the congested Alona Beach in Barangay Danao. Bunao issued a building permit to Dataland for the construction of three buildings on June 19, 2017, designed in “ascending order” starting with a three-story structure in front of the beach, followed by another four-story building with the 12-story building at the rear of the property. According to Dataland’s MR, a Height Clearance Permit (HCP) No. I-0034-17-D4HIn7 was granted by the CAAP Office of the Director-General, Capt. Donaldo A. Mendoza, Assistant Director-General II on January 25, 2017, for the construction of the proposed 46.25 meters high Ivy Wall Hotel Building with a top elevation of 53.00 meters above mean sea level. The location of the proposed structure is at lot 3990 which falls within the vicinity of Tagbilaran City Airport, according to the HCP which is valid until January 25, 2019. On the inland zone, the ordinance states that the tallest structure shall be limited to a maximum height of 30 meters from ground level, and no structure shall be allowed to be taller than Dayo Hill, the highest elevation in Panglao Island. Dataland also claimed that they were denied the right to due process in the recall of its building permit because of the absence of a written notice of a complaint alleging violations of the building code and was not afforded the opportunity to present evidence and arguments on all issues raised. 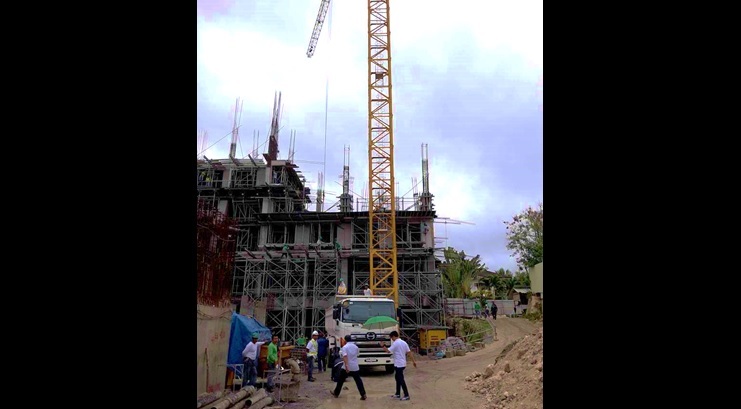 The Panglao Island Chamber of Commerce (PICC) questioned the construction of the 12-story structure while Municipal Councilor Rogelin Degoma filed a complaint before the Office of the Governor which was forwarded to the Sangguniang Panlalawigan (SP). According to Rommel Gonzalez, PICC President, the height of the proposed hotel will serve as the benchmark for all buildings along the beachfront of Panglao whose owners are keenly awaiting the response of the LGU on the future of building construction in Panglao. The SP, in turn, approved Resolution No. 2018-031 on January 12, 2018, requesting the OBO to conduct an on-site survey to determine if the construction is within the 100 meters area situated right after the 20 meters salvage zone.